This Solar Powered Batteries can charge every device with 5V input voltage. Make sure to use a compatible and certified/original cable to guarantee the charging efficiency. Buckle for Hang on bags or camps, to fix solar charger's position and prevent from falling. Micro USB charging cable for most Android devices and input charging cable. Two 1A&2.1A output ports for Fast Charging Simultaneously, providing fast charging speed for your devices. Built-in Intelligent Chip can control the output current in a safe range; When your devices has been fully charged, the battey will stop charging automatically. Over heat and over current tech has been applied on this product, safety is always priority. 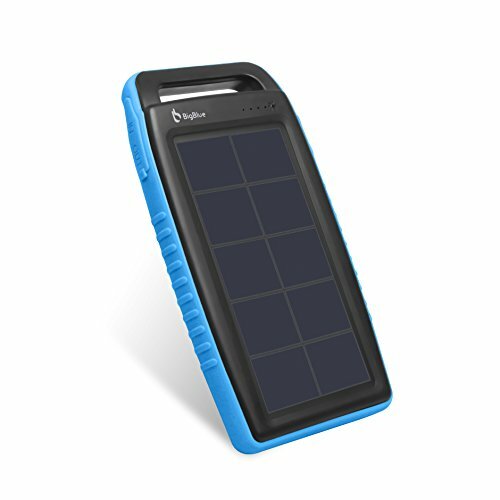 Once the solar phone charger detected that your device is full charged, it will cut off the connection and turn off automatically to save energy. 1. We highly recommend to charge this battery charger through USB. Solar charge is only recommended under emergency condition. As the solar charging speed will subject to sunlight intensity and panel conversion rate and it takes a week to obtain a full recharge when powering only with sunlight. 3. The red LED indicator turns on indicating it's recharging via solar panel.